Now Accepting # 1 - 7 Plastic Bottles, Tubs and Jars in your Curbside Recycling Bin! After 20 years of having to answer with a disappointing “no,” Eco-Cycle will finally answer “yes” to one of our longest-standing, most frequently-asked questions: “Can I recycle my yogurt and dairy tubs at the curb?” Yes. Yes you can. That feels good to say, and even better to do. Go ahead and try it... after you read a few of these basics about the new program. > Why did guidelines change? > What about drop-off centers? > Avoiding plastic beats recycling it! What plastics can we recycle at the curb? We will now accept all plastic bottles, tubs and jars numbered #1 - 7 (see the examples above). But wait! Don’t get too recycling happy and throw all plastics in the bin. Please just give us those #1 -7 plastic bottles and tubs and help us keep these important NOs out of the bin. What plastics are not accepted? Plastic bags are by far the WORST contaminant in the recycling bin. Please do not put plastic bags in your bin and please do not bag any materials. Clean, dry and empty plastic bags with #2 or #4 can be recycled at the CHaRM or at participating grocery stores. Plastic bags collected at the curb get caught in our sorting equipment, cost our program money and are not recycled. While white foam cups and containers often have a #6 on the bottom, they are not a recyclable plastic. These products can be easily avoided for their safer, reusable or recyclable counterparts. It couldn’t be as simple as ALL #1 - 7 plastics, could it? The broad #7 category was designed as a catch-all for polycarbonate (PC) and “other” plastics. Unfortunately, new compostable plastics, made from bio-based polymers like corn starch, are also thrown into this category and labeled with a #7. But, you can tell them apart from their petroleum-based relatives because compostable plastics ALSO have the initials PLA on the bottom near the recycling symbol. Some may also say “Compostable.” Please look carefully for that coding, and if you see it, you have the green light to toss the container, not in the recycling bin, but in your COMPOST collection bin. PLA is NOT recyclable, but it IS compostable. For more recycling guidelines, check out the Dirty Dozen most UNwanted contaminants in single-stream recycling and download a single-stream recycling guidelines poster. Due to recent hikes in the price of oil and increasing global competition for materials, off-shore market demand for recycled plastics has increased. Social and environmental conditions at these overseas facilities have improved as well. This means while most of our plastic bottles with a #1 or #2 will continue to be marketed domestically whenever possible, we now have the opportunity to accept some additional plastics that have been so difficult to recycle for so many years. What plastics are accepted at drop-off centers? Find recycling guidelines for your local recycling drop-off center. 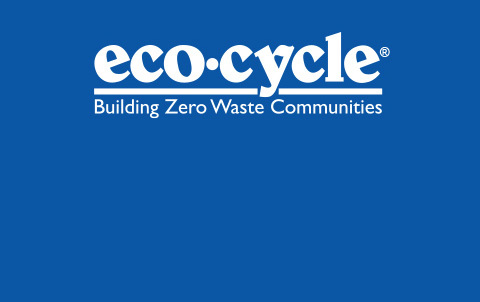 While many plastics are now recyclable, Eco-Cycle encourages recyclers to avoid plastics and all other packaging as much as possible. Over the past 45 years, single-use packaging, especially plastic packaging, has increased by more than 10,000%! Simply recycling these products does not negate the environmental damage done when the resource is extracted or when the product is manufactured. When you do buy plastics, know that all plastics are not created equal; some are far more problematic than others, both in manufacture and in use. The numbers and letters on the bottoms of plastic containers indicate resin types and hold the key to knowing the most important plastics to avoid. 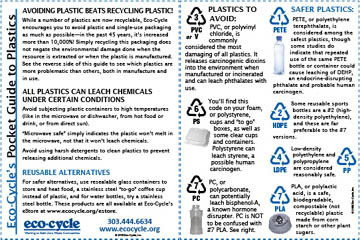 Download this "Pocket Guide to Plastics" to learn which plastics are safer than others, and then share it with a friend! 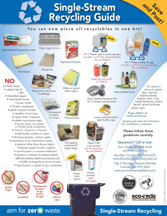 Eco-Cycle created new recycling guidelines for single-stream recycling and these new plastic materials.